Successful hairstyles for thick, wavy, coarse hair start at the root, literally and figuratively. You want to moisturize your hair with all the products you use from shampoos to finishing sprays. Once a week, try to use a deep conditioning treatment, which will moisturize your thick, wavy, coarse hair. Use your regular conditioner and wrap your hair in plastic wrap for an hour or two to create smooth, luscious waves that will work for many hairstyles. Make the most of your thick, wavy hair. 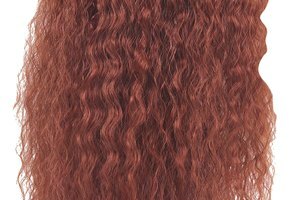 While straightening your hair may seem tempting, the wreck and ravage it can do to your hair simply isn't worth it. Use shampoos and conditioners that promote moisture and volume or curl. Try a full ponytail. Work a styling cream through dry hair. If your waves are very frizzy or out of whack, go over them with a wide barrel curling iron, which smooths waves and adds shine. Bring hair to the back of the head and secure with a hair elastic. With hairspray, use your fingers to tease the ponytail. This is a great hairstyle for getting hair off your face and neck while looking stylish. You can also try a loose, wavy bun accompanied by a French braid. Part hair on the side or in the center and choose one side to begin French braiding. Braid until you reach the nape of the neck and secure with a hair elastic. On the last twist of the elastic, don't pull hair all the way through. This will create a loose bun that looks perfect for a casual outing or on vacation. For evening, updos are a smart choice. Thick, wavy, coarse hair can become frizzy as you dance the night away, so keep hair up and away from the face so it's picture perfect throughout the evening. Enhance waves by using large rollers or a wide barrel curling iron. Distribute styling cream through hair and place hot rollers throughout (ideally, two at the crown, two at each side and two at the back of the head); or use a curling iron to go over waves, grabbing about 2 to 3 inches of hair at a time. Shake waves out and apply a shine serum. Bring hair up to the top of the head and pull through a hair elastic for a large, wavy bun that creates a classic silhouette. Do not worry about the bun being perfect, as it looks more modern if it's unkempt. You can pull off this same hairstyle, only at the nape of the neck. Do a deep side part for a dramatic effect framing your face. Gather hair at the nape of the neck and create a bun. Both hairstyles look fantastic when accompanied by large earrings. Wearing hair long and loose on a daily basis is a great way to rock your naturally wavy hair. It cuts down on the heat applied to your hair, which is less damaging in the long run. Wash and condition hair at night. Towel dry hair and apply a styling cream, focusing on the ends of your hair. Gather hair at the back or top of head and twist from the root to ends and coil into a bun, securing it with a hair elastic. Sleep on hair like this. 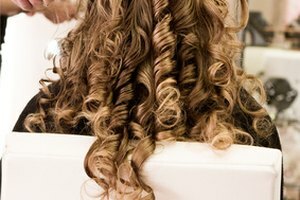 Remove the elastic in the morning and you'll have full, bouncy waves that should stay that way all day. Work shine serum into your hair for a more polished look. Samantha Cabrera is a freelance editor and writer, covering fashion and beauty. She currently serves as the Fashion Director of Papierdoll.net, and writes Style-television.com, a blog of b5 media. Cabrera also serves as the National Women's Fashion Examiner for Examiner.com and has written for About.com and Bride.ca. Cabrera is a native Texan and attended the University of Houston.